Hitchcock is often thought of as a director who felt uncomfortable with, and even hostile to women. There is plenty of evidence to support this view, in his life and in his films, but there is also evidence that he admired strong, independent women, at a time when these characteristics where often considered undesirable. 'Women in peril' were a feature of many Hitchcock films, as they had been in cinema since its early days. Hitchcock's first film, The Pleasure Garden (1926), features a woman who falls victim to a deceitful and violent husband, while the victims of the killer in The Lodger are blonde women. Hitchcock himself favoured blonde actresses, and more than one was obliged to bleach her hair for a role. Several actresses complained that Hitchcock could be brutal on set, and he often seems to enjoy watching his female characters suffer. 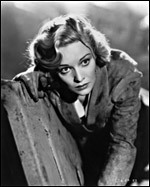 Hitchcock saw female sexual vulnerability as a powerful dramatic device, which he exploited ruthlessly, as the example from Blackmail, in the previous section, illustrates. In Champagne (1927), the heroine - a silly rich girl whose father feigns bankruptcy to teach her a lesson - imagines that an attractive but sinister man, who she meets while waitressing in a nightclub, is sexually assaulting her. Only at the end of the scene does Hitchcock reveal that she is imagining it, and he withholds till the end of the film the information that the man is really in the pay of her father and has no evil intentions. But like Alice in Blackmail, Hitchcock's women also fight back. The heroine of Sabotage (1936) murders her terrorist husband, while in The Man Who Knew Too Much (1934), Jill is an expert markswoman, who uses her skills to shoot down the villain menacing her daughter, while the police look on helplessly. Both Young and Innocent (1937) and The Lady Vanishes (1938) feature women whose resourcefulness and determination solve the mystery.